Spring is here! 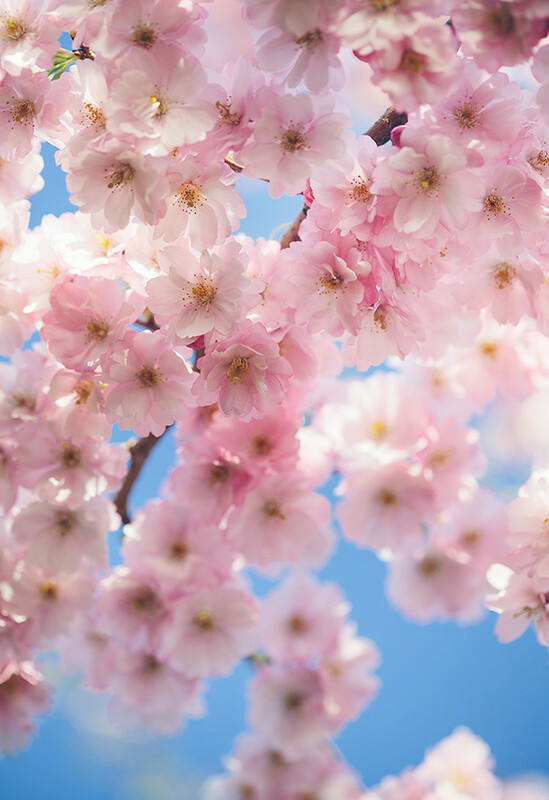 When the cherry blossom trees are in full bloom, you know it is spring for sure. 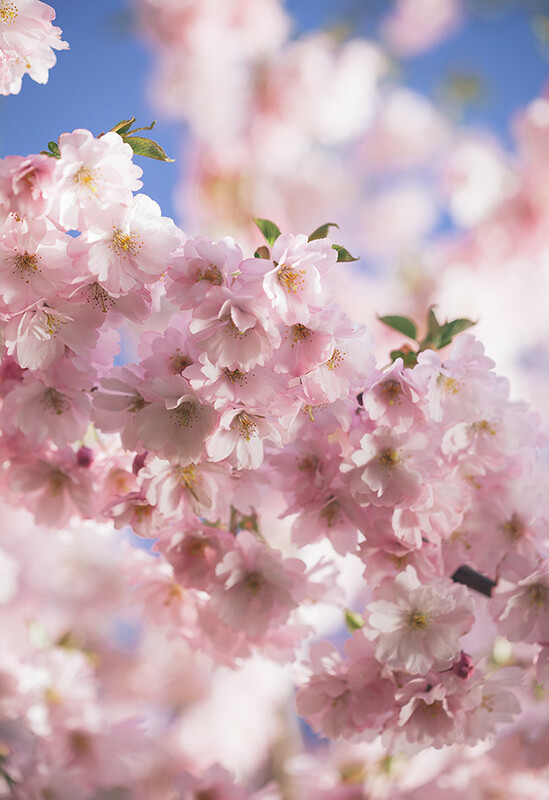 For me, spring is the start of something new and it always leaves me feeling inspired and thankful. I have been imagining this cake for a few weeks now. That’s where I get most of my ideas nowadays, from my imagination (and I always say my imagination is the worst). Sometimes I feel like a little kid, daydreaming about all the cakes I’m going to make. Usually it begins with a picture of what the cake is supposed to look like in my head. I must say, it turned out even better than imagined. Pretty and delicious. Win win! While on the subject of starting new, you know that other blog I had? I gave that up. Call me cupcake is my baby so I’ll be spendning all my blogging time here from now on. That feels really, really good. I love putting all my effort into one blogpost (such as this one, a monster post!) and honestly, sometimes it takes me 2-3 days or more to put together one post. 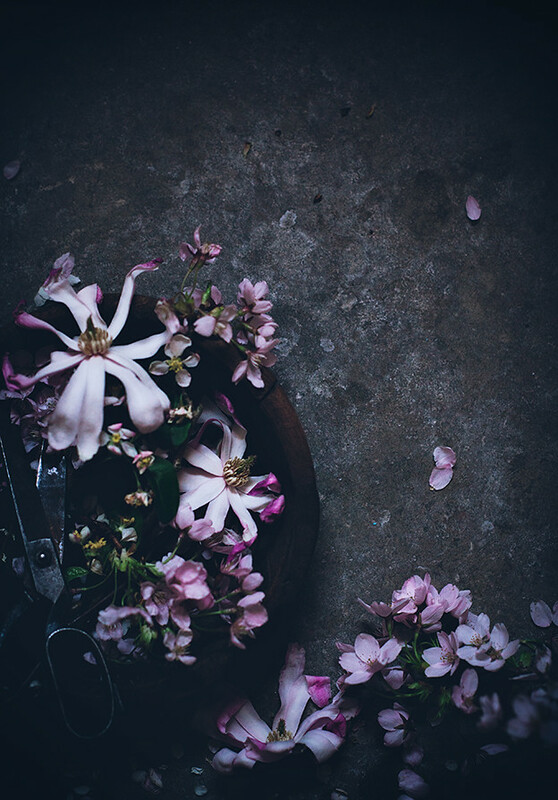 It definitely feels like a new start as I have been feeling very guilty about neglecting the blog (not because I have to blog, but because I LOVE to blog). I still haven’t figured out whether or not I’m going to write recipes in Swedish on here, so please let me know if you have any ideas or suggestions. I’m still struggling with the measurements! Did I tell you I have a new stove and oven by the way? I didn’t know I was getting one, but suddenly there it was outside my door (well, and the men who were going to install it too of course). I was a bit worried about the oven, what if I suddenly sucked at baking?? You never know. Luckily that wasn’t the case. I made macarons, and they turned out a bit wonky (I think my new oven is very.. damp), but still pretty ok looking. -This cake is pretty awesome, but it also does take some time to make. Therefore I suggest making it over a couple of days. 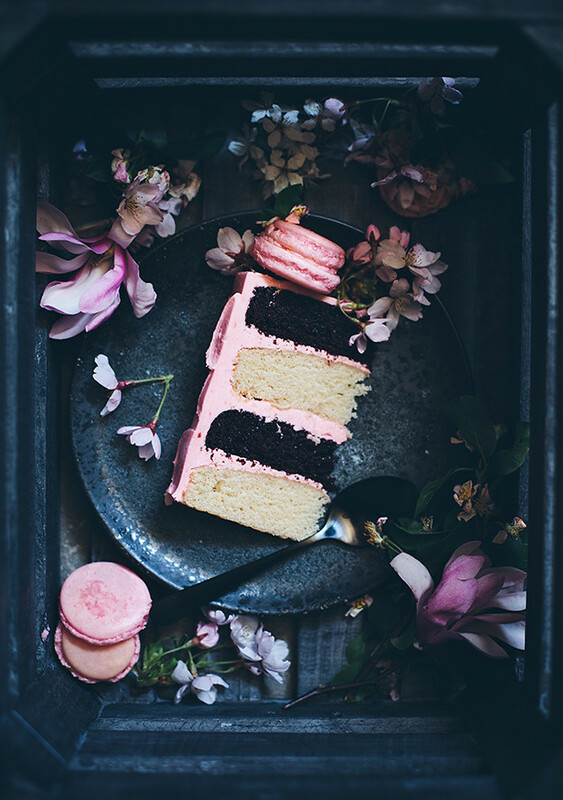 You can bake the cake layers one day and make macarons (if you’re making macarons that is) and buttercream the next day, for example. -Remember to bring all ingredients to room temperature before baking! 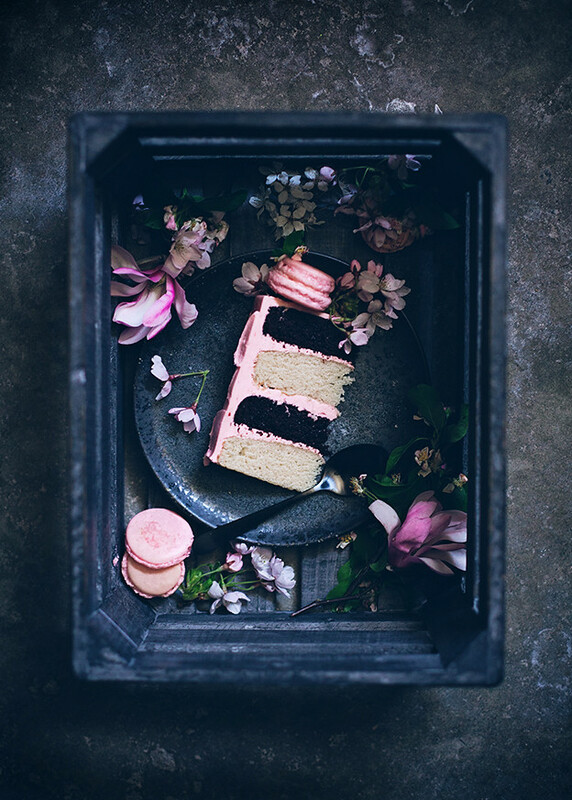 -I wanted to use the buttercream on the cake for the macarons aswell so if you will have any filling left depends on how much you use for the cake. I had enough leftover to fill all my macarons, but if you don’t you can always freeze the leftover macaron shells as you only need 8-10 macarons. -The vanilla cake is best baked in two cake pans. I tried baking all the batter in one pan and it turned out really dense and flat. The chocolate cake batter is much lighter and can therefore be baked in just one pan. -The chocolate cake layer can be quite crumbly, so it’s better to either let it rest in cling film in room temperature overnight before cutting it in half. If you don’t have that much time, put it in the freezer for 30-40 minutes or so before cutting it. Use a serrated knife. 1. Heat oven to 175°C (350F). 2. Prepare two 15 cm (6 inch) baking pans by greasing them with butter and dusting them with flour. 3. Beat butter and sugar until light and crumbly. 4. Mix together flour, baking powder and salt in another bowl. 5. Add flour mixture and milk in batches to the butter mixture and beat until just combined. 6. Add vanilla and the egg white and mix until smooth. 7. Divide batter among the pans and bake for about 25 minutes or until a toothpick comes out clean. 8. Let cakes cool in their pans for 15 minutes before inverting them onto a cooling rack. 2. Prepare one 15 cm (6 inch) baking pan by greasing it with butter and dusting it with flour. 3. Melt the butter and let cool. 4. Mix flour, cocoa powder, baking powder, baking soda, salt and sugar in a large bowl. Add butter, egg, milk and water to the mix and beat or stir by hand until combined. Pour batter in the prepared cake pan and bake for about 30-35 minutes or until a toothpick comes out clean. 5. Let cake cool in the pan for 20 minutes before inverting it onto a cooling rack. -Smbc is definitely easier to make if you have a stand mixer. An electric mixer works too, but it’ll take you a little longer. -Your smbc will likely become either soupy or curdled when adding the butter. This is actually quite normal and happens almost every time I make it. The important thing to remember is to NOT THROW IT AWAY! Please don’t. You probably didn’t do anything wrong. It’s just that the egg whites and the fats in the butter really aren’t meant to come together that easily. -First try beating the crap out of it (I mean for a long time, like 10-15 minutes if needed). If the buttercream is too cold, just put the bowl over a sauce pan with simmering water again for a few seconds and beat until smooth again. If it’s too hot, just put it in the fridge for a few minutes and beat again. If that doesn’t work, leave it at room temperature and go do something else for a while, then try again. -Smbc actually freezes well! Remember to bring it to room temperature before whipping it smooth again. 1. Pour egg whites and sugar in a clean and heat proof bowl (preferably stainless steel or glass). Put the bowl over a sauce pan with simmering water. The bowl should fit snugly, and the water should not be touching the bowl. 2. Whisk the sugar end eggs with a whisk constantly until the mixture reaches about 65°C (about 140-150 F). If you don’t have a sugar thermometer, just rub some mixture between your fingers. If the sugar has melted and mixture is hot to the touch, it’s ready. 3. Remove the bowl from the heat, whip until white, fluffy and cool with a stand- or electric mixer. This step can take a 5-10 minutes. 4. When the bowl feels cool to the touch, start adding the butter, piece by piece. Don’t worry if the mixture looks curdled and soupy (look above for a remedy). Add pureed strawberries to the buttercream and whip until smooth. Add food coloring if desired. 1. Cut chocolate layer in half so you have two chocolate layers. 3. Spread a layer of buttercream on the first layer (I used about 1 dl / 100 ml / 0.42 of a cup for each layer). 4. Put the next layer on top. Repeat step 3 until you have used all layers. 5. Spread a thin layer of buttercream on the cake to secure any crumbs. Put the cake in the fridge (but leave the bowl of buttercream in room temperature) for 10 minutes. Remove cake from the fridge and spread another, slightly thicker layer on the cake. All ingredients are measured in weight since this recipe is very precise! 1. Grind the almonds in a food processor or blender. Sift to get rid of any large pieces or lumps. Mix the powdered sugar with the ground almonds and give it another pulse in the food processor or blender. 2. In a large bowl (preferably stainless steel or glass, not plastic), whip the egg whites with a stand- or electric mixer. As the egg whites start to foam, add the granulated sugar one tablespoon at a time and continue whipping until the mixture is glossy and stiff. You should be able to hold the bowl upside down without the meringue sliding out. 3. Fold in the almond mixture carefully and slowly into the meringue using a spatula. Add food coloring if desired, and stir until fully mixed. Don’t overmix! The mixture should flow like a ribbon when you hold up the spatula. If you want to test if the batter has good consistency, just put a dollop of batter on a piece of parchment paper. If the dollop slowly “flattens”, you’re good to go. If not, keep folding. 4. Fill your piping bag and pipe the macarons onto baking sheets. Remember that the shells will “flatten” once you’ve piped, so don’t make them too big. About 2,5-3 cm (1 inch) is enough. Let macaron shells set for 60 minutes to form a dry skin. 5. Preheat oven to 150° C (300F). Bake for about 9-13 minutes. You can test if they are done by touching the tip of a macaron, if it “wobbles” it’s not done. Let cool completely, then fill and sandwich together. Store in airtight container in the fridge, preferably for a day or two before eating. Har precis hittat hit från din instagram! WOWOWOWOW så fina bilder och jättefin blogg 🙂 Inser att jag har lite att läsa ikapp! Jag röstar för recept på svenska! Jag är också pepp på våren! Allt blir så vackert. Jag läser utan problem texterna på engelska men skulle verkligen uppskatta recepten på svenska. I'm so glad you will be posting more on here! I'm also happy you converted some of the measurements:P Thank you and Happy Good Friday Linda! Wishing you the best of luck darling! And this cake?! Unreal. 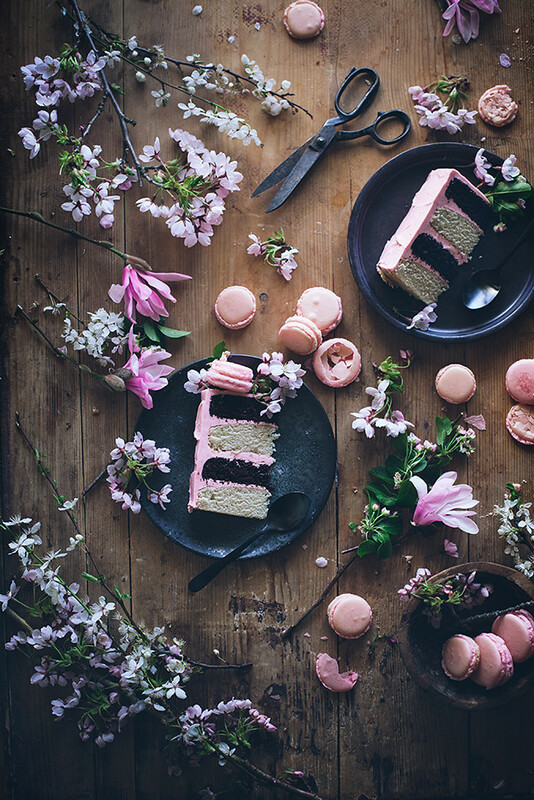 Wow, this has some of the most beautiful food photos I have ever seen. And the layer cake? Just amazing. Words can't do it justice. This is so pretty!! Pls keep writing in english… you and your posts are awesome and i don't want to miss it!!!! Good luck starting fresh girl!! Your pictures just get more and more beautiful with each post! These are just perfect, the only way to describe it. Every picture in this post is just absolutely stunning! I'm so glad we'll be seeing more beautiful desserts from you! Cheers to new beginnings and a cake that's almost too cute to eat. Stunning work as always, Linda. Not without reason, are you one of my most favorite bloggers. P.S. I'm currently in Germany and have visited a handful of bookstores already – Torten by Linda Lomelino is just everywhere. And not just somewhere tucked away in the bookshelves. No, it's on the displays. Yay! So happy for you. The book is a gem. Tack för en jättefin blogpost! Jag skulle rösta på engelska, de flesta från Sverige förstår väl ändå?? Jag gillar verkligen när du skriver i gram, då det är det allra bästa sättet att mäta upp sina ingridienser. Jag måste få fråga om din buttercream.. När jag gjorde ett av dina recept från Lomelinos tårtor med meregue buttercream så tyckte jag att den allt föll ihop så efter att ha lagt till smöret i vitorna. Det känns ju tråkigt då man vispat vitorna så fint. Jag gjorde dock en italiensk maräng… ska testa schweitzisk maräng nästa gång.. men faller marängen ihop för dig också då du tillsätter smöret? Super wow!!! Your pictures in this post evoke such an emotional response. Absolutely beautiful! Om du har tid vore det helt underbart med recept på svenska också, gör det helt klart lite lättare när man står med receptet =) Helt gudomligt vackert! Massor av kramar och glad påsk! Fantastiska bilder. Underbart! Vilket konstverk. Wow, that is SUCH a beautiful (and delicious-looking) cake!! I love the picture of the blossoming flowers, too (especially since nothing has bloomed yet where I live). What an absolutely gorgeous post! I think this is my favorite thing you've ever done! Beautiful! Change is good. I hope you enjoy focusing on Call Me Cupcake. We love your posts! 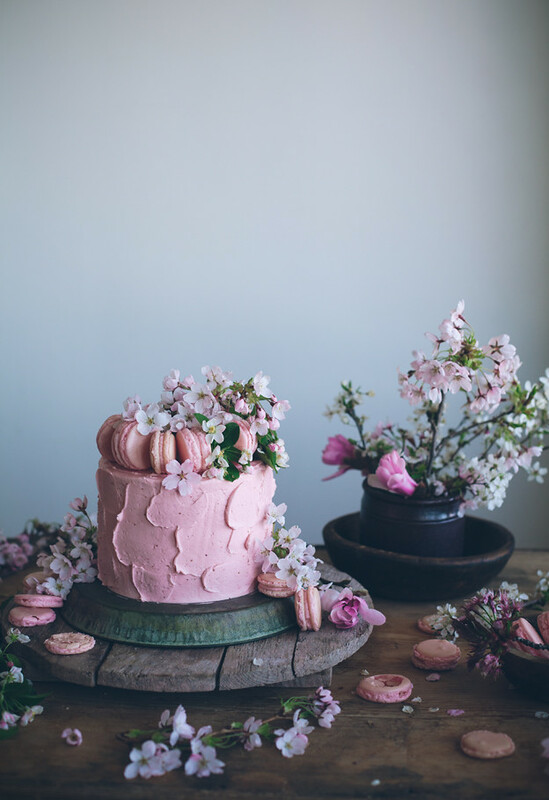 this cake is a dream! i love your photography, keep up the good work! 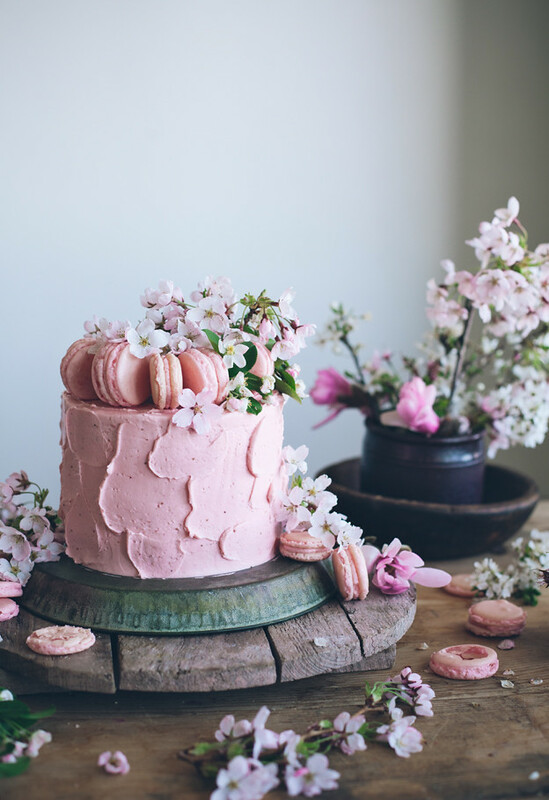 Amaziiiing, I'm in love with this spring Caaaake! Jag röstar för recept på svenska, helst i gram. Tack för en underbara blogg! Every one of these images is just stunning…love! It doesn't hurt that there's Neapolitan cake involved either. ohmygosh, this is so beautiful it makes me want to cry. (i'm sorry, i get emotional because i love baking so much.) like, seriously though, i can't tell you how much i freaking love this. your styling is so beyond awesome. 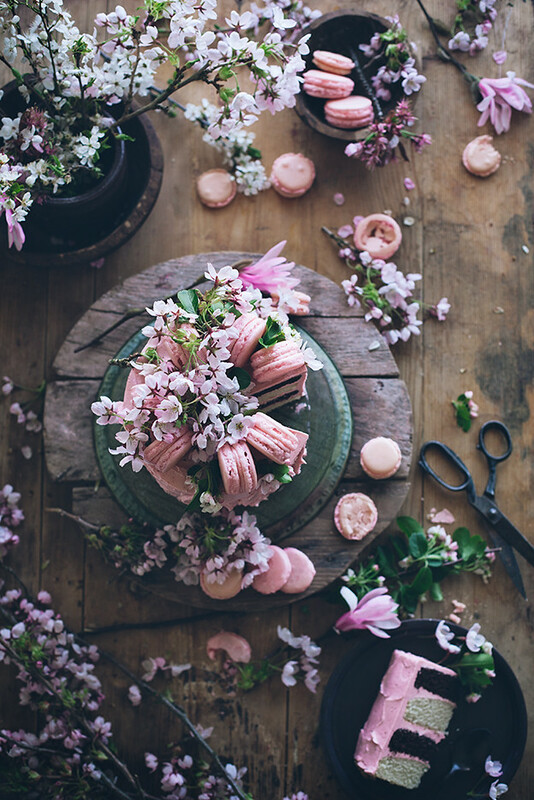 Beautiful post, I adore the spring colors! Amazing post and cake! After seeing it on your instgram I hoped you would post it here 🙂 So glad you did. You've outdone even you with this one. It's heart-stopping! I hope you will continue to publish your recipes in English as well. If not, I guess I'll have to learn Swedish. Your cake imagination is unparalleled! this is absolutely stunning! you are always such an inspiration with how you set up photos. gorgeous. Really stunning! I'm very happy with weight mesurements since they are the most precise. Jag uppskattar recepten på svenska. Fantastisk inspirerande blog. Ser fantastiskt ut, men jag har en annan sorts fråga.. Vad är färgkoden för dina väggar??? Perfekt grå! Urfint!! Att du skriver på engelska känns helt lugnt, men jag hade gärna haft allt i gram eller dl, och inte i cups. Vilket som kommer jag ändå fortsätta kolla in din blogg. Superinspirerande! Må väl!. hello. Linda! i'm from Russia, thanks for you blog! verkar som jag är den en av de få som gärna vill ha receptet på svenska också 🙁 iallafall i svenska mått och inte cups 🙂 tycker förresten det var ett bra val att satsa på denna bloggen, den andra kändes lite överflödig faktiskt 🙂 kram! This is beautiful, I love the photos. Please keep writing the recipes in English, I'd hate to miss out on them. 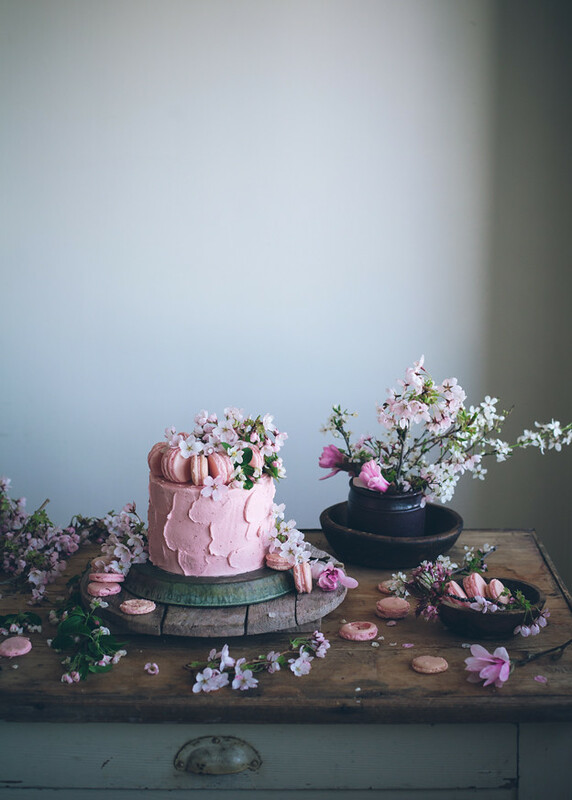 I really love that cake and your photos…it looks amazing!! That cake looks so delicious!!!! I've fallen in love with this cake!!! I'm sure I will do it soon. 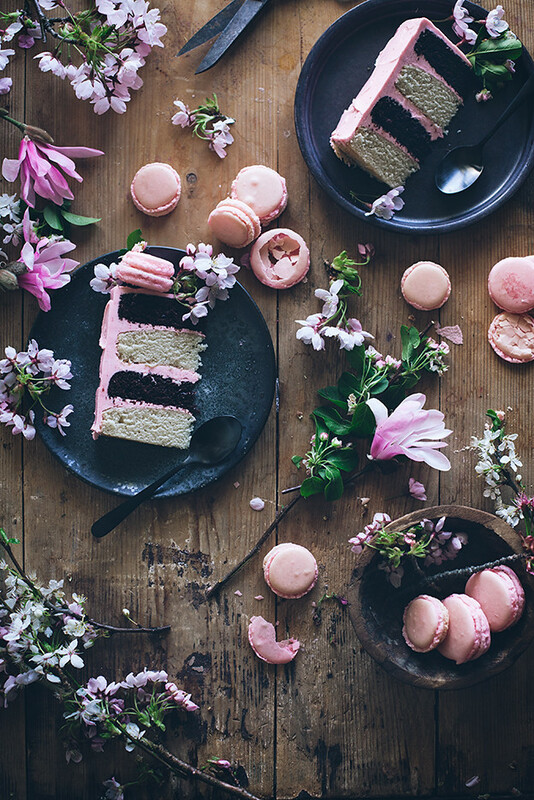 I have just come across yourblog via Four Months In Paris – cherry blossom & macaroons indeed – what a beautiful post! I am looking forward to seeing more. Åh vad skönt för dig att kunna koncentrera dig på bara en sak! Älskar den här bloggen! Men du snälla, fortsätt slänga in lite recept på svenska då och då. Jag har så fruktansvärt svårt att förstå skillnad på baking soda och baking powder på engelska och sådär. Jag älskar din blogg! Skulle gärna önska recept på svenska, om inte alla, några stycken då och då. Såg en blogg som länkat till dig och jag blev stum av beundran. Vilka bilder! Magiskt! Återkommer absolut igen. This is JUST GORGEOUS as always. I wish I could sit in your kitchen and watch you create and shoot sometime. In a totally non creepy way, of course 🙂 Love this cake. 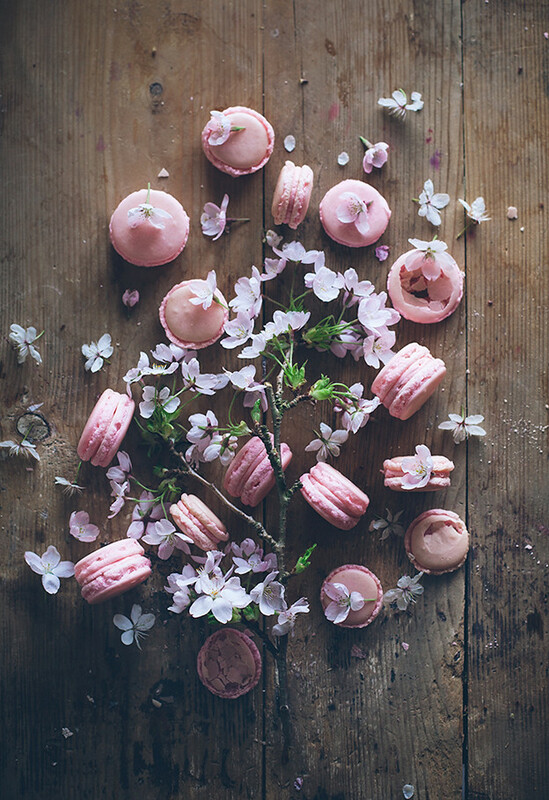 I love macaroon and cherry blossom is my favorite flavor. Your photos make me happy. So lovely! Beautiful! These pictures make me smile. I'm looking forward to seeing you here more often. My GOD ! I couldn't eat such a piece of art ! SO stunning. Words cannot describe the beauty of these photographs. Hej Linda, skriv på svenska med!! Hej! Jag tycker att du gör underbara tårtor och kakor, men det gör mig ont att du inte ens skriver recepten på svenska!! snälla gör det! 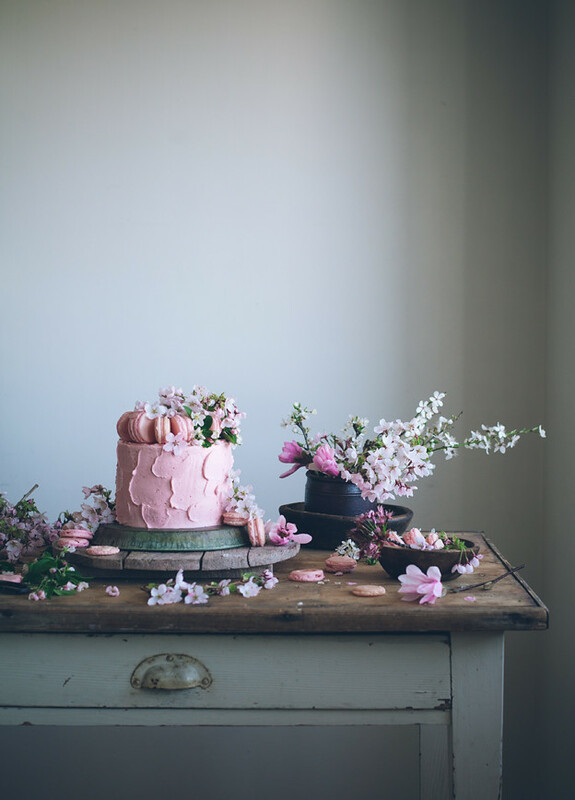 This is the most beautiful cake and photo set I have ever seen. Seriously, just stunning. The WORK you put into this is so evident. Thank you for creating gorgeous food art! Pinned many times! 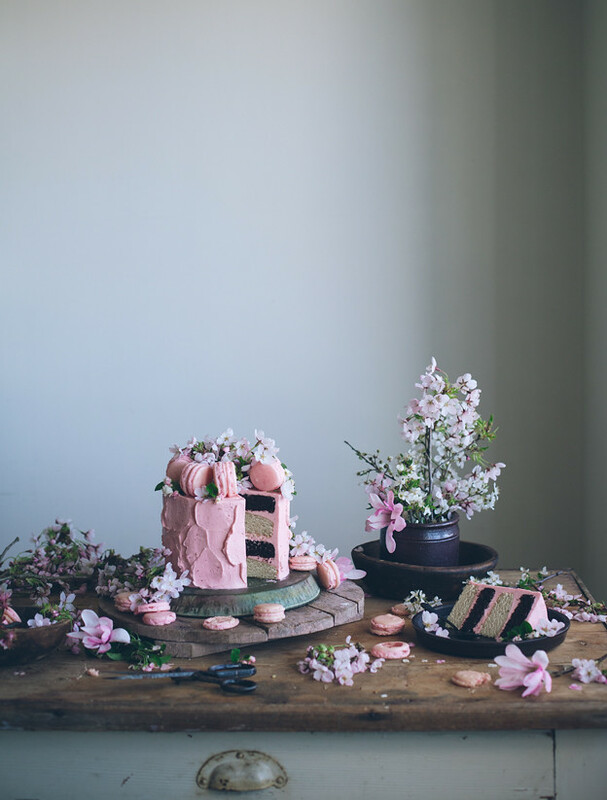 This cake and these photos are absolutely beautiful. Inspiration for a friends wedding cake! This is amazing! I wish I could do this 🙁 (I'm allergic to strawberries) But it looks so beautiful and delicious! Your pictures are incredible, and this cake ! Craving for macarons right now ! Do you think I could halve the chocolate cake recipe to have 2 layers of vanilla and one of chocolate? As a three layer cake would best fit our family size and take away the stress of cutting it in half haha. Also, I was thinking of just using a regular buttercream from one of your other recipes? So adorable!! Love the macaroons!! Neapolitan is also the best so you can have all the flavors!